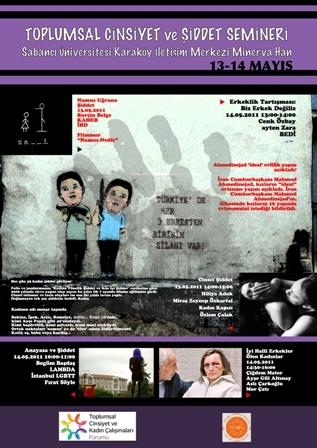 Sabancı University Gender and Women's Studies Forum, Civil Involvement Projects and students are cordially inviting you to the "Gender and Violence" conference that will take place at at Karaköy Communication Center on May 13th and 14th, 2011. The purpose of this conference is to talk, discuss and brainstorm on gender and violence by bringing together diverse perspectives of academicians, students and activists. Please note that the conference language is Turkish.